precision cutting up to .405″. Help’s with cutting coax and center conductor prep for pins. 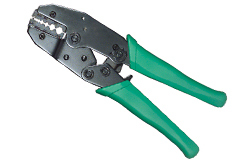 $20.00 Coax stripper; 2 blades for RG-8, 11, 213, 214, 9913F7, LMR-400, LMR-400UF, BURYFLEX. Strip Length 6 or 8mm for braid. $20.00 Coax Stripper: 3 blades for RG-58, 59 ,8x, 8xmini, 6, 223, 142B, 400, LMR-195, 195UF. Strip Length 8mm for braid and 4mm for dielectric. $20.00 Coax Stripper: 3 blades for 2 blades for RG-8, 11, 213, 214, 9913F7, LMR-400, LMR-400UF, BURYFLEX. Strip Length 8mm for braid and 4mm for dielectric. 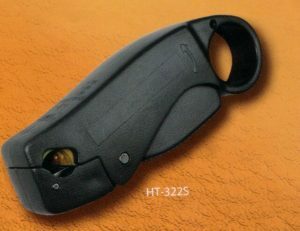 HT-322 series stripper’s all come with a hex key to adjust blades depth. Rotate tool counterclockwise on coax for cut. $10.00 Coax Stripper: 2 Blade: RG 58, 59, 62, LMR-195, LMR-240, RG-8X mini., RG-6’S, RG174, 316, LMR-100A Braid cut 6mm [1/4″]. 4 V-BLOCK SETTINGS. 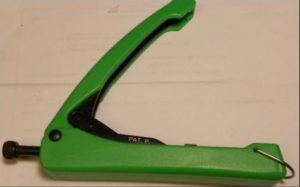 $25.00 Coax Stripper for RG-174, 316, RG-196 and RG-402 with practice. Designed for BNC’s for 8218/0222/735 coax or order new blade sets from Paladin . $30..00 Universal Tool Frame No Dies. USES ALL HT DIES. 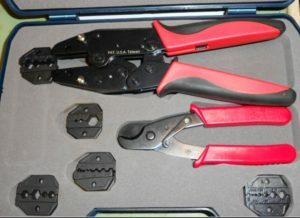 NON INSULATED TERMINAL DIE SET. #20-8 AWG. 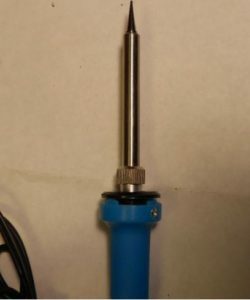 $30.00 Connex 12 Ident CP W/Spring Locator uesd on BNC connector pins. 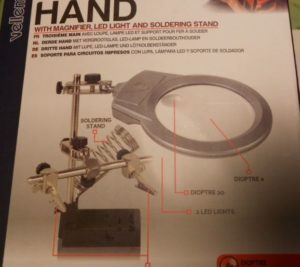 $4.00 SOLDERING STAND . 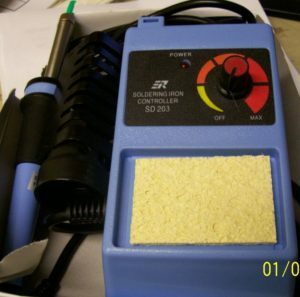 FITS ALL STANDARD BODY SOLDERING IRON’S LIKE SD 103. 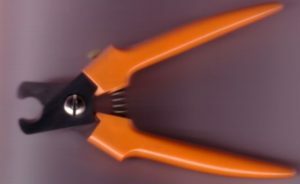 $37.50 P-Pole Ratchet Crimp Tool : Does 15amp, 30amp and 45amp contacts. 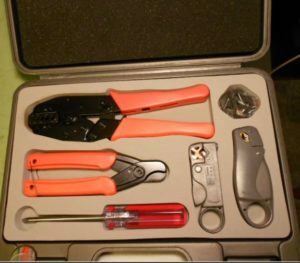 This tool is a great “go-kit tool” all popular sizes in one tool. 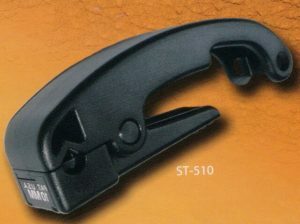 $37.50 Crimp Tool with a fixed .610 Hex Die for LMR-600, LMR600UF, CNT-600. ***SALE**** Ratchet Crimper With 2-Coax Hex Dies, 2-Stripper’s: 1- HT-332: RG-58, 59, 6, 8x, LMR-195, LMR-240, RG-174, LMR-100A and 1- HT-322S: RG- 8, 213, 214, LMR-400, 9913F7, Bury-flex. 1-Cable Cutter, 1-Screw Driver. All in a heavy duty carry case. Dies sizes .255 /.213 /.043 /.069 /.128 /.100 /.429. And does all cable diameters from RG-174 to RG-213, and LMR400. ***SALE**** Ratchet Crimper With 2-Coax Hex Dies, 1 – APP-POLE Die does 15 amp, 30 amp, 45 amp contacts. 2-Stripper’s: 1- HT-332: RG-58, 59, 6, 8x, LMR-195, LMR-240, RG-174, LMR-100A and 1- HT-322S: RG- 8, 213, 214, LMR-400, 9913F7, Bury-flex. 1-Cable Cutter, 1-Screw Driver. All in a heavy duty carry case. Dies sizes .255 /.213 /.043 /.069 /.128 /.100 /.429. Does all cable diameters from RG-174 to RG-213, and LMR400. Ratchet Crimper with quick change die jaws. Just push button to release die and place new one in. 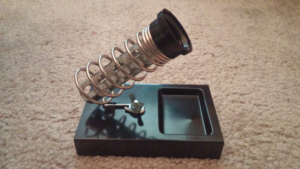 Come with 5 hex die set’s and a coax cutter . 1- 3K HEX DIE: [.429 / .128 / .100 ] RG-8, 213, 9, 214 , 9913, 9913F7, LMR-400’S, BURY-FLEX. All in a heavy duty carry case. $15.00 F CONNECTOR COMPRESSION TOOL . F MALE F6-MCV by Amphenol . Fits all styles of RG-6. 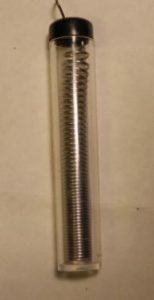 $1.50 60 / 40 Solder in a tube . 7 feet #18. 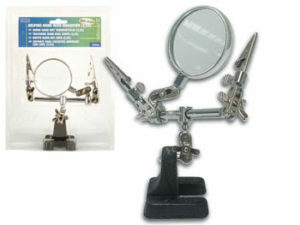 **NEW** Helping hand with 4x and 20x Dioptre Magnifier, 2 Led Lights [3 AAA batteries needed]. 2 Clamps and a soldering stand all on a heavy base. 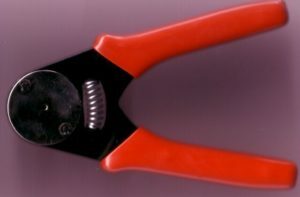 $4.00 Braid trimming scissors; a must for all connector prep. Stainless Steel. 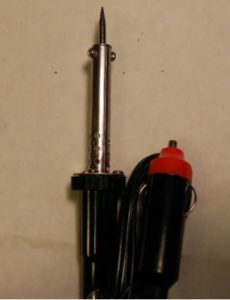 SD 104 12 VDC 30 WATT SOLDERING IRON. A MUST FOR EVERY GO KIT. 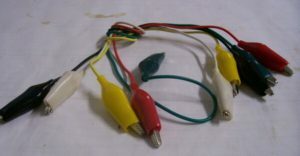 $5.00 Handheld non-contact AC tester with LED indicators. Simply apply this device to a power cord and you will be able to check the cable’s voltage. 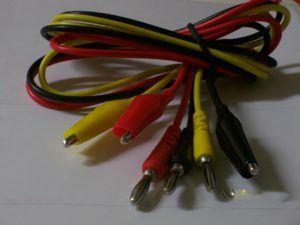 $1.50 One set of alligator leads on a 18″ cord, 5 pcs. per set. 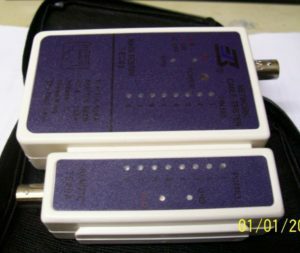 $7.00 Network Cable Tester, can test BNC, RJ11, RJ45 cables. Uses a 9-Volt battery (not supplied).